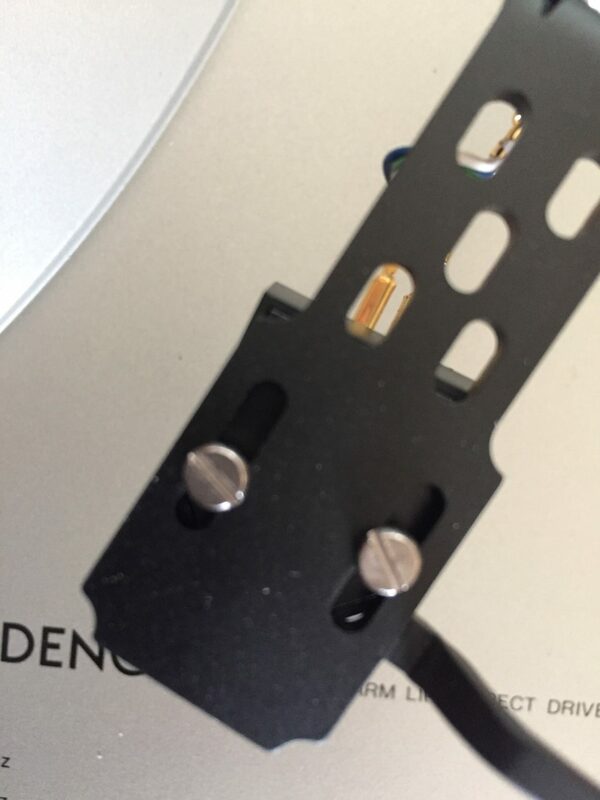 Here’s a closer look at a Denon DP-30L I serviced recently and a reminder of why it’s important to take your deck to someone you trust, even for a cartridge installation. For more Denon DP-30L goodness, check out this service and review article. This particular unit came in for service having just been fitted with an Ortofon 2M Red moving magnet cartridge and new lead-out cable. You’d think she be good to go right..? A well known local hi-fi store fitted the 2M Red for my customer. I have to say this was easily the most misaligned cartridge I’ve ever seen. The images below don’t really do justice to just how bad this was. I can safely say that whoever installed this had no idea about what they were doing. 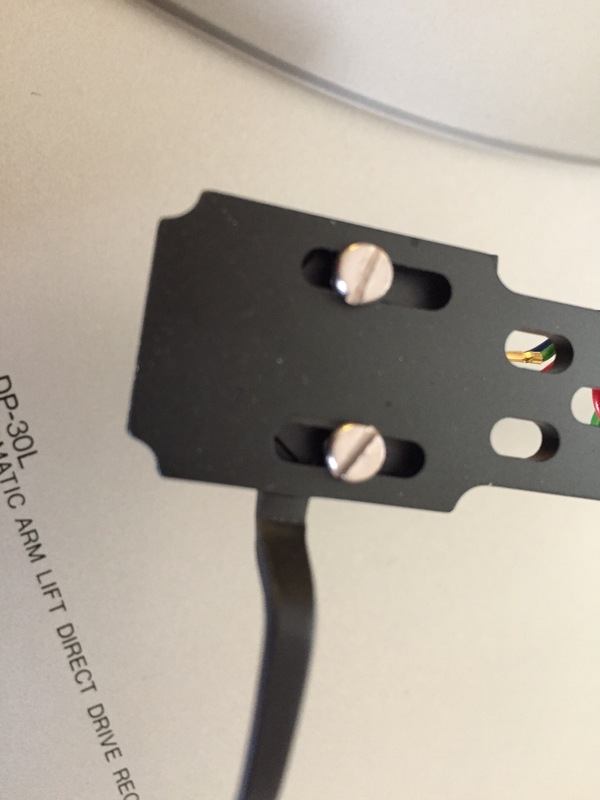 Note the heavy misalignment of the cartridge in the headshell. Some deviation from zero is acceptable when shooting for a particular alignment. Rarely is much needed though and certainly never this much. The cartridge mounting distance was also incorrect. These issues are easily fixed, but surely the deck should have been set up correctly in the first place? The less said about this the better. Remember, this cartridge was installed at a hi-fi store, someone who supposedly knew what they were doing. DP-30L, as I received it. There were a couple of other problems with this lovely deck. Firstly, the owner’s friend had fitted this new lead-out cable for him. Very nice of him to do that, for sure, but he used the wrong type of cable and one that is too thick/stiff for the job. This looks to be a car stereo cable, purchased from a local electronics supplier. It’s not a grade or type that we would normally use for a turntable. It’s so thick and stiff that he was forced to Dremel out the back of the cabinet to accept it. There was a problem with quality control – you’ll see what I mean in a moment. This cable is stiffer than the power cord and whoever installed it has Dremeled out the case just to fit it through. This is not a great installation, I recommend a supple studio-grade cable from Mogami for something like this. Hmm… this cable is really stiff! Right now you’re thinking – “Mike, you’re pretty harsh on these issues…” The thing is I’m perfectly happy with work done properly. The basics are here, for sure, but the problem is that the owner experienced channel dropouts after this cable was installed. Can you spot why, from the image below? This is what you might call an ‘installed short’. There’s quite a difference and I’m hoping that readers can see that attention to detail really matters. In this great example, it makes the difference between a deck that works perfectly and one that doesn’t. The last issue I wanted to resolve was that the automatic arm lifter was non-functional. Normally, the lifter drops the needle at the start of a record and lifts it at the end. In this deck, the arm-lifter linkages were jammed. The layout of the DP-30L, arm lifter motor and linkages to the left. I disconnected everything and, after lubrication and careful examination, I determined that the mechanism had been reassembled incorrectly, presumably by a previous tech troubleshooting the arm-lifter mech. Once I’d resolved this, the arm lifter worked perfectly. Finally, I serviced the motor and made some adjustments to the master speed controls on the main board, so that when you switch from speed to speed, no adjustment of the vernier speed control is needed. First, the motor has to be removed. Opening up the motor then gives access to the rotor and stator sections. The bearing should be cleaned and re-oiled. I usually use a solvent to remove any greasy build-up inside the bearing well. Same applies for the rotor or bearing shaft. This is typical of the dirt that comes out of a bearing assembly. Lastly, the deck went to the workshop for some electronic adjustments. I support the deck on a jig to allow access to the mainboard underneath. This is an extra step that makes the difference between a deck that works and one that works perfectly. I restored the range of vernier speed control so that the verniers now operate right in the middle of their range. An equal number of turns of the knob up and down produces the same speed adjustment up and down, say 3% each way. Additionally, both speeds (33 and 45 rpm) are spot on now when you switch between them, without needing to fine tune with the vernier. Previous PostQuad 44 Preamplifier ServiceNext PostRare Musical Fidelity Tri-Vista 21 192K Tube DAC for Sale! Great stuff but painful to see what is happening these days with TT. Most people have no idea what is important and how to fix it. Do you do also measurements for speed and Wow and Flutter, to check if the motor is running perfectly and the bearing is in good condition? Yes you need an analyzer and special Testrecords. Anyway, you are doing lovely things with care. I really like that. Regards from Holland. Hi Chet, yes agreed, I have a wow and flutter meter along with a huge range of other test and measurement equipment, test records and tools. I’ve been doing this a long time so wow and flutter analysis is only warranted when I test a deck and hear something not right. I listen to every deck I service of course.